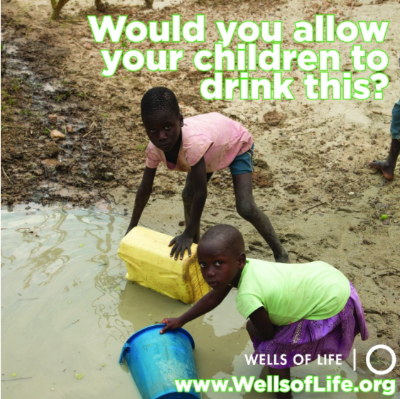 Each one of these wells provides life-changing water to ~1,000 people. This year we want to donate a well in memory of Archbishop Oscar Romero. If you don't know his story, read more here: http://www.romerotrust.org.uk/who-was-romero. A great man who will be celebrated in a Ugandan village with a well baring his name. Please help us honor a great man and give life-saving water to a village in need. MOST OF US HAVE NEVER REALLY BEEN THIRSTY. We’ve never had to leave our houses and walk 3 miles to fetch water. We simply turn on the tap, and water comes out...CLEAN. Yet there are thousands in Uganda who don’t have clean water. In Sub-Saharan Africa, most rural people spend 3+ hours a day, collecting small amounts of dirty water. It is traditionally women and girls who walk for their family’s water supply. Each bucket can weigh 44lbs and is normally carried on top of the head. At the end of the day, a woman’s opportunity in education or small business is entirely inhibited by collecting water that may cause disease. A water well gives a community easy access to clean, reliable water. It prevents disease and death, and gives people the foundation they need to thrive. This year Wells of Life is asking people all over the world to raise money and awareness by running for water in our 5K/1K Water Challenge! You can walk as an individual or organize a group to participate and fund a well by the day of the event. Ask family, friends and co-workers to sponsor your run. The money and awareness that you raise by joining our 5K/1K Water Challenge will provide clean water wells to remote villages in Uganda. Read on for info regarding participating in our event. We encourage each team leader to raise $6,000. If your team consists of 20 runners, each runner can raise $300, which will complete the funding of one well! Find sponsors to commit to your personal goal and you will provide water for 1,000 people! For as little as $6 ONE PERSON can have abundant, clean water for up to 25 years.